Just a quick card post this morning. This is a retirement card for a female police officer. I have had these tiny little handcuffs for forever and they turned out to be perfect for this card, definitely not a conventional card but I think it works. I used my fabulous My Mind's Eye Fall in Love designer paper and layered it on burgundy cardstock. I used foam tape to pop up the different layers. 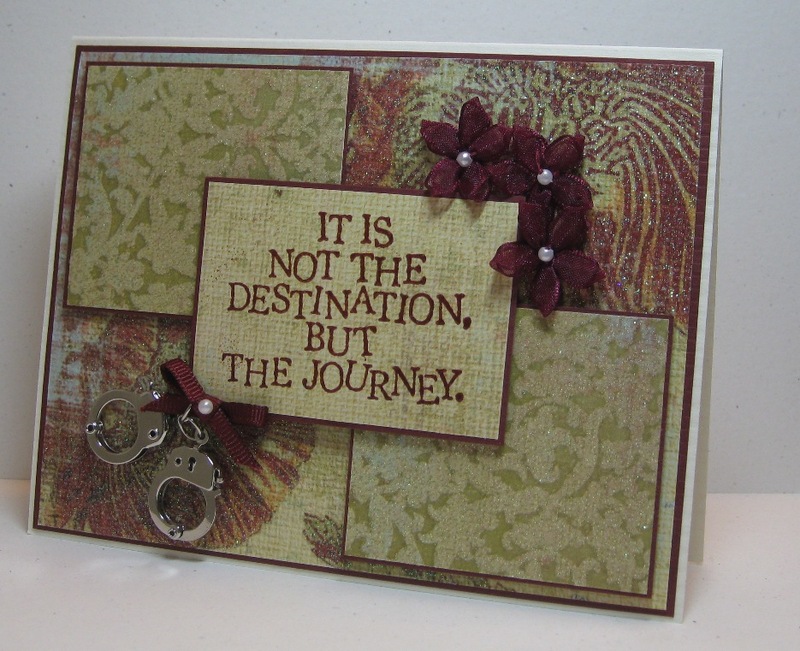 The sentiment is embossed with a burgundy embossing powder to give it a little gloss. I finished by adding the flowers, bow and cuffs. Supplies: Cream and burgundy cardstock, Designer Paper-My Mind’s Eye, Inkadinkado- Destination, Offray – Hot rage(cuffs), Offray flowers, misc pearl and ribbon. Monday already :). I had such grand plans of multiple challenges last week and well..... Mojo today though and this sketch is perfect for a very special card I needed to make. I love how this card turned out, the photo does not really do it justice. I opted for a total square card as this is intended for a male recipient. The heart and sentiment were stamped with Versacolor Pinecone and embossed with clear embossing powder, I had distressed the surface with a sanding block before hand to make the image stand out. The edging does not stand out as much as it shows in the image. 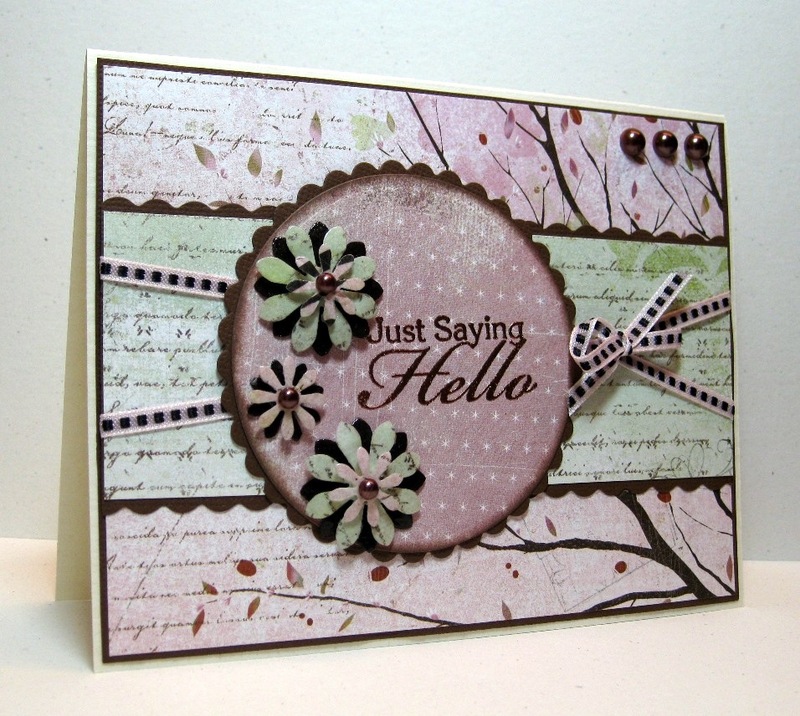 I punched out a couple of Sizzlets flourishes then embossed them with clear embossing powder. I used my Cricut and my Sure Cuts A Lot software to cut out the hearts, then I used a punch to make the button holds. I also embossed the top button with clear embossing powder to give it added gloss. Happy mid-week. Just a quick post, for one of those challenges of past. This is #3 from Clean and Simple Sunday. I know I am long past the challenge date but it was still fun to take a chance with the sketch. I changed it up just a little but I think it turned out nicely. I used a embellishment from Jolee's Boutique that I have had for a long time, added a simple sentiment and some ribbon. Supplies: Cream and blue cardstock, Designer Paper-Memory box, Jolee's Boutique, TPC Studio-Brush Stroke greetings, misc ribbon. Just a quick post this evening :) I am mixing two challenges. The first is for Mojo Monday, love the sketch today. The second is for a new challenge I am trying which is Jingle Belles. 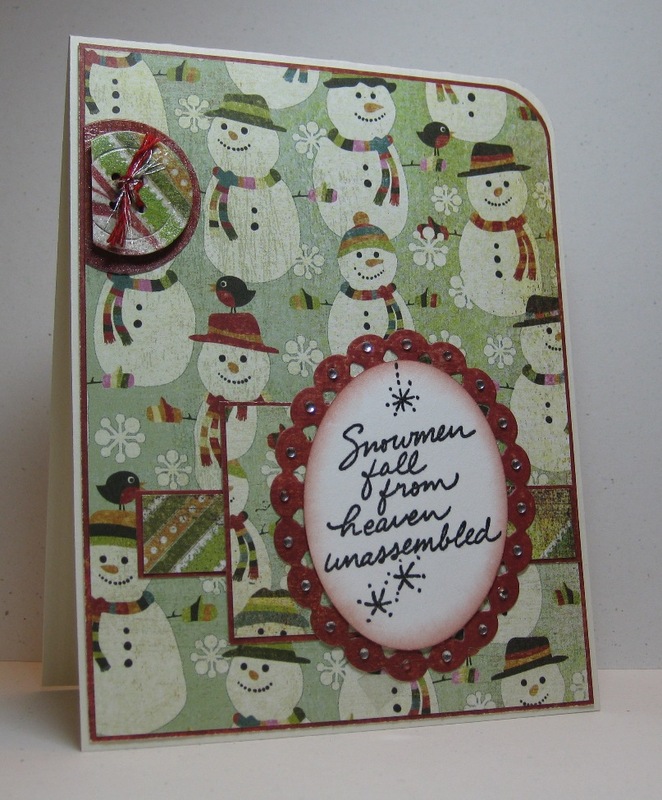 This challenge is to create a Christmas card each week. Did I ever think I would be making a Christmas card in June... nope, but that is exactly what I did. How fun is that. Sooo this is my duel challenge card. For this weeks Jingle Belles challenge it was all about the layers, so I added backgrounds to each of my layers and popped up the buttons. Supplies: Cream cardstock, Designer Paper- Basic Grey-Fruitcake collection, Stampendous-Heavenly snowmen, Spellbinders Nestabilites, Sizzlets-buttons, misc gems. I have a friend who competed in a Triathlon today, such an amazing feat. I was not able to cheer her on, so I made a card instead to give to her with some fabulous chocolate. I have high hopes for forgiveness :). Chocolate can fix lots :). I know I know, I am still working on the simple part, but I really like how the card turned out. I have had a few Recycled Mat Pads from K&Company for years but have not used them, today I made the whole card with pages from the Lilac Lavender pad (well with the exception of the card base). I really don't use my Slice enough, this image I thought, is perfect. I cut it out twice in hopes of making a 2-D image but it turned out to look like two ladies running together or maybe a shadow but either of those work ok too. I made a slight boo boo with the stamped sentiment which is why I re-stamped it and added it as an an additional sentiment box. I added the floss and pearls to add a girly touch, which my friend will appreciate. I also ended up adding a little more glitz using my Gelly Roller-Clear star pen to add sparkle in the center of some of the flowers. Supplies: Cream cardstock, K&Company-Remake Lilac Lavender Mat Pack, Slice-Think Pink,Purple-Embroidery floss, Recollections-Pearls, Clear Star Gelly roller. Happy Father's Day to all you great Dad's. I changed it up just a little, all in all I think it turned out fine. Even with my recent practice I still ride the edge with these Clean and Simple cards, I started with using a embossing folder to create the background texture, I of course needed to add a couple of layers then embossed the motorbike and sentiment using Versacolor Pinecone and clear embossing powder. I finished by edging the image. 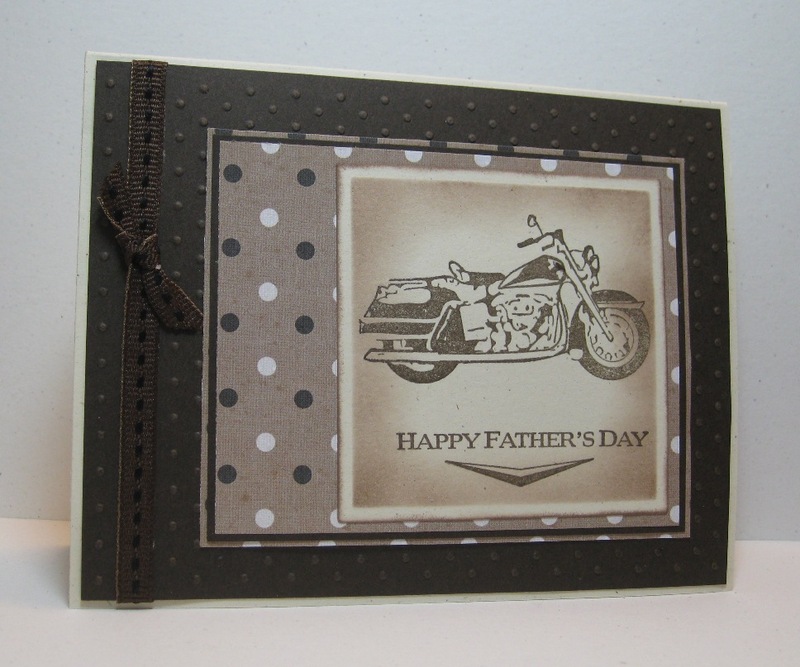 Supplies: Craft and brown cardstock, Designer Paper-Hot off the Press,Cuttlebug-Swiss Dots embossing folders, Stampin' Up!-Motorcycle, Inkadinkado-Happy Fathers Day, misc ribbon. As our beloved Canucks battle in the background, I figured it would be a good time for me to tackle 2 challenges in one go. I figured I had most of those down with the exception of A, my boys were determined for me to put an Armadillo on the card?? ? right.. because they are so abundant in British Columbia. They did make a good argument however instead, I tried to make my band of ribbon look like a road of Asphalt.... am I stretching it :) well if that fails I can always say I used Adhesive, although I would be surprised if someone said they put it all together with bubblegum. The second challenge is Clean & Simple Sunday Challenge #15. I realized when I peeked at the site today that I must have posted my last one late. Oh well, I still plan to go back and do 1 thru 12 at some point. This is my card, I know the buttons are extra but apparently I love my buttons. 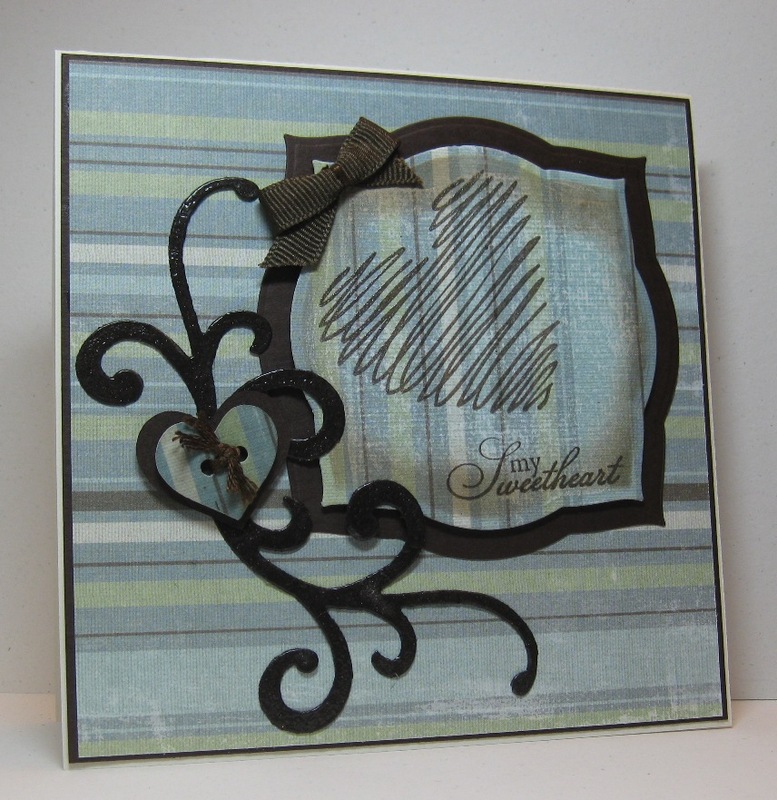 Simple enough, I layered striped DCWV Linen Closet designer paper on brown cardstock. 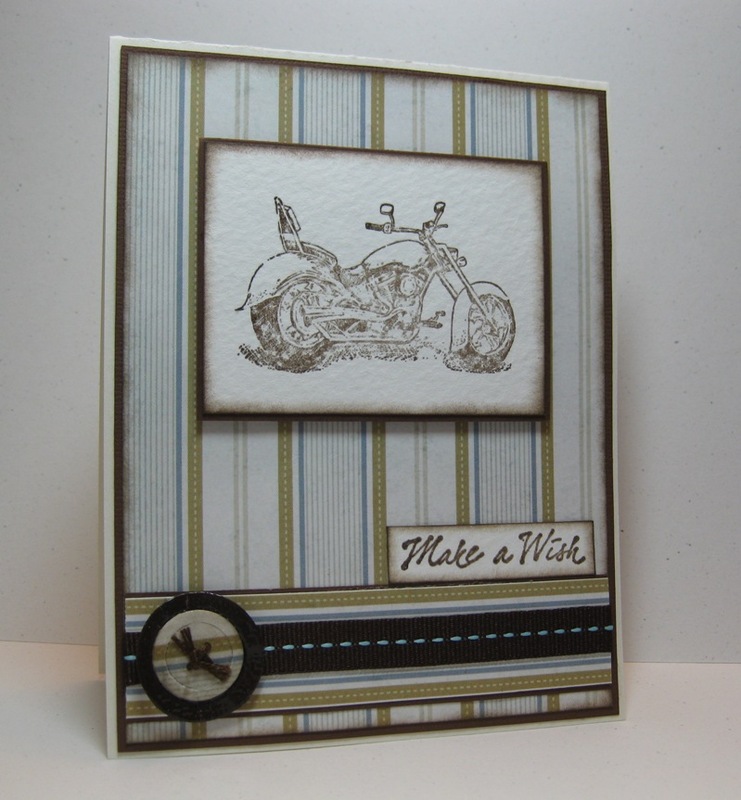 I embossed the stamped motorcycle then edged it and layered it. I layered the ribbon base before adding the ribbon trying for a highway look with the multiple dotted lines :) in my mind anyway. I stamped and embossed the sentiment, then finished with Sizzlits buttons embossed with clear embossing powder and threaded with embroidery floss. 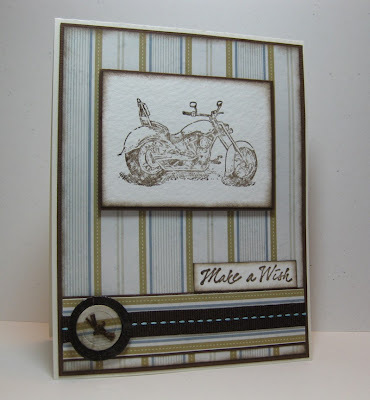 Supplies: Cream and brown cardstock, Designer Paper-DCWV, Stampin’ Up!-Motorcycle, TPC Studio-Brush Stroke greetings, Sizzlits buttons, Offray ribbon. Mojorific Monday :), after a brief weather delay the sun is back out and shining pretty in my neighbourhood and it is Mojo Monday. Both make me smile. 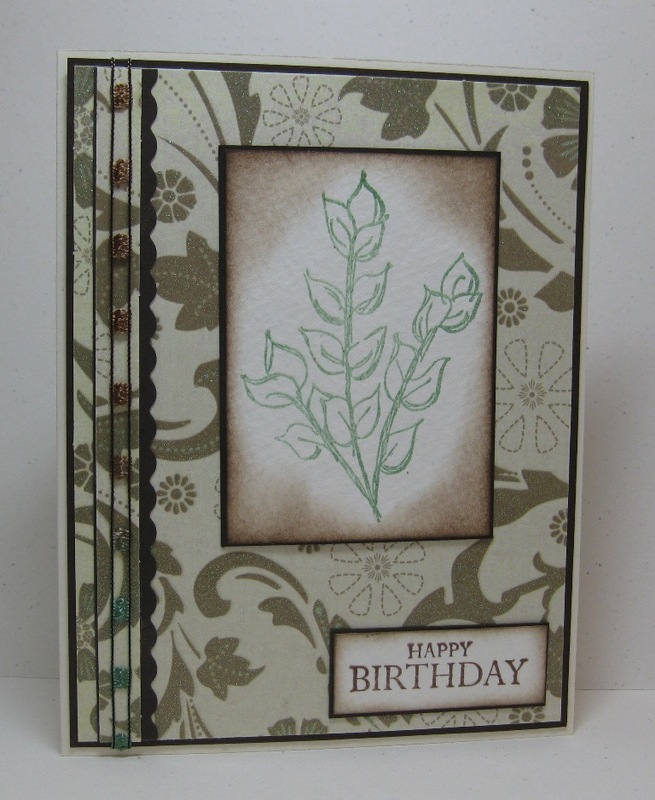 I had a few false starts with this card, I had the card stock and the designer paper all picked out but rest... just did not come together right away. up to give them dimension. I embossed the sentiment with Copper embossing powder, there is a slight sparkle to the flowers and the sentiment but unfortunately it was not captures in this image. The only thing I am missing is the little flag bit and well it was not going to work. Supplies: Cream and brown cardstock, Designer Paper-Memory Box, TPC Studio-Hello, KaiserCraft- Brown pearls, Marvy Flower punches, Craft Essentials Copper Embossing powder, misc clear embossing powder, misc ribbon. It is beautiful and sunny here this morning and it makes me smile. 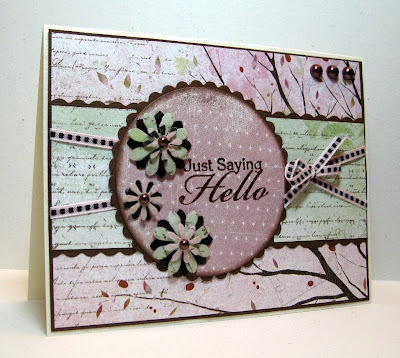 I had a wonderful day yesterday, I had the chance to get together with a group of ladies I met on Splitcoaststampers to do a little crafting. 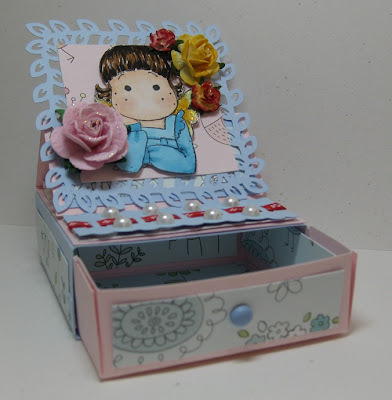 Cabio (Cabio's Craft Corner) invited us into her amazing craft room where she gave us a fabulous Copic demo and we put together this cute little Mini Easel Card Box. Sorry I don't have a list of supplies we used to create this. With the weather getting nicer I am sometimes finding it harder to sit in my craft room to create but yesterdays get-together has put me in the mood. 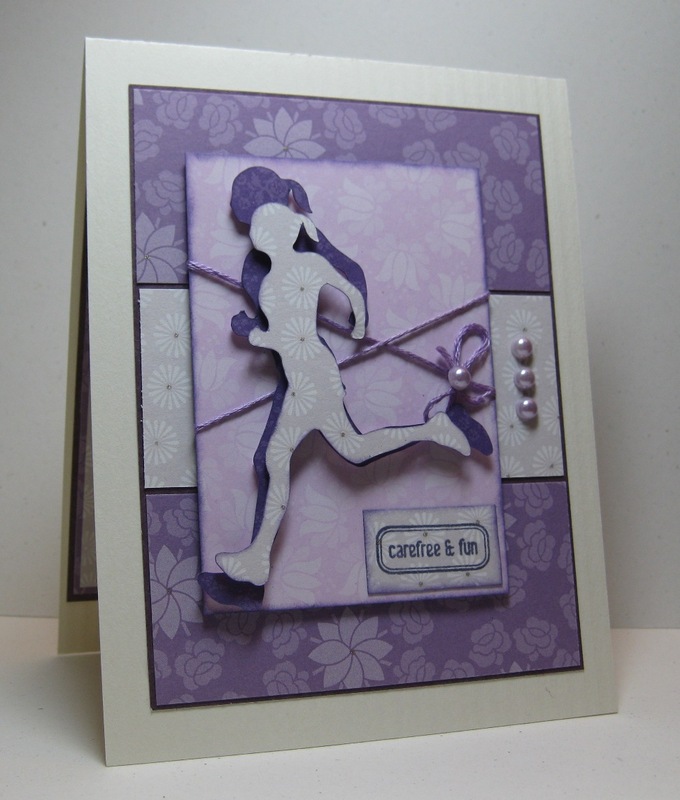 So this morning I made a card for Clean & Simple Sunday Challenge #14. I am still pretty excited about using some of the new craft supplies that I picked up last weekend so this card flowed pretty easy. I feel like the leaves need something but I could not figure it out so it will stay as is for now. 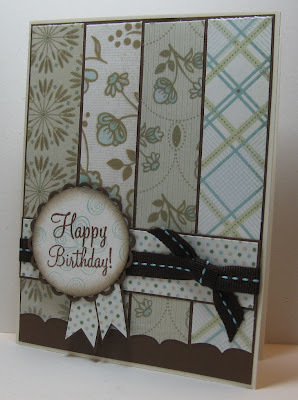 Supplies: Cream and brown cardstock, Designer Paper-DCWV, Gina K Designs- Happy Birthday, Kaiser Craft-Leaves, misc ribbon. It is a beautiful sunny day here in Victoria, I love that I have the day off to enjoy it. Add in a little Mojo Monday and the day is perfect. I am very keen to use my new supplies and I love this sketch. I started with my new Linen Closet stack of paper by DCWV and some chocolate brown cardstock. 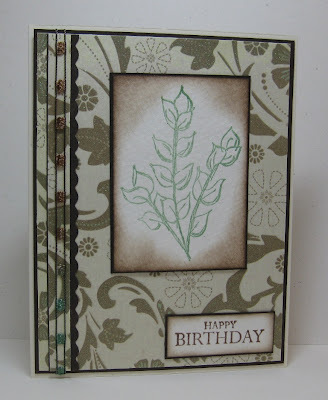 I used one of my new stamp sets for Happy Birthday embossing it with copper craft essentials embossing powder. 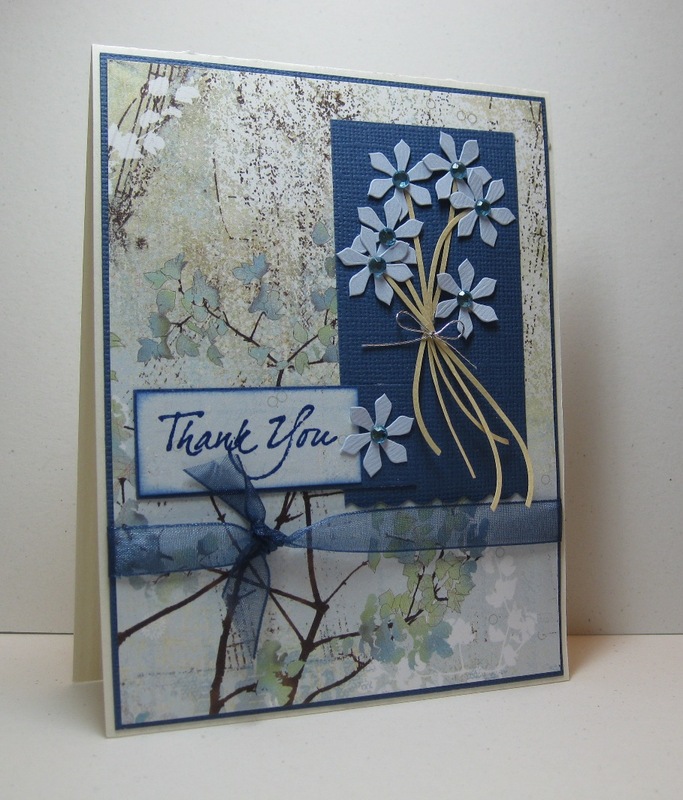 I then stamped the swirl flower multiple times in Versacolor Celadon and edged with brown ink. Supplies: Cream and brown cardstock, Designer Paper-DCWV, TPC Studio- Happy Birthday, Memory Box-Spiral Flower, Spellbinders-Lacey Circle, EK Success circle punch, EK Success bracket border punch, misc ribbon. Allergies anyone. My husband and took a recent trip down to Washington. I could not believe how much Scotch Broom is everywhere. In some areas it's smell was so strong it was even a bit bothersome to me, thank goodness Mike or I don't suffer from allergies, I could not imagine suffering through this everyday. This is what we saw for miles along the freeway. At Cabela's in Lacey there were fields and fields of it, this is where the air thick with its smell.﻿ I have to admit that it is beautiful to look at. Mt Rainer was clear and stunning to look at. I did not get a good picture but this is a great glimpse. The mountains were beautiful and clear to look at all three days. Thank you sunshine. Joann's had a great sale on 40% off all paper craft items. I went a little wild with the stamps, I did not take a picture of it all. Maybe tomorrow. Another quick post for this week. 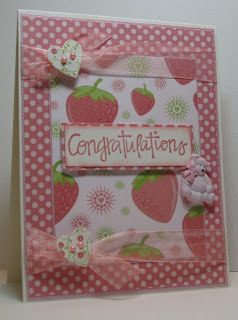 Supppies: Cream and pink cardstock, Designer Paper-DCWV, GStudios-Congratulations,Jolee-buttons, Sizzlets-buttons, Recollections-pealrs, misc ribbons.